Elected and appointed officers for 2016 were inducted at a ceremony during the East Valley Marines, Detachment 1296 monthly meeting. Bill Ebright, Department of Arizona Commandant of the Marine Corps League, was on hand to do the swearing in. 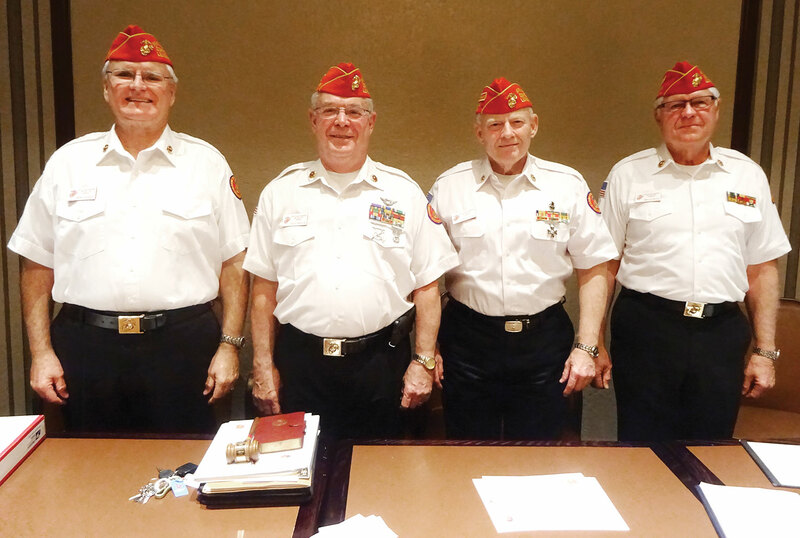 Elected officers are Dave Minick (Commandant), Dave Lott (Senior Vice Commandant), Mike Bishop (Junior Vice Commandant) and John Van Houten (Judge Advocate). The unit focuses on holding fundraising events that go toward Marines Helping Marines, with emphasis on Arizona Marines. The next major fundraiser is the third annual Golf Tournament held at Bear Creek on April 15. You can visit the website to download a registration form or sponsorship form. East Valley Marines welcome visitors and prospective members at their monthly meetings. These are held on the second Tuesday of each month in the Bradford Room at the Oakwood Country Club. Check out the website at www.eastvalleymarines.org for more information.